I'd like to lead into this by saying I'm new to comic books. My prospective on the stories and artwork come from extensive exposure to Japanese Manga, but never American Comics. In many ways the visuals and artwork enhance the stories. In some ways they make it feel limited. With that in mind here is my take on the three series based solely on their first issue. Star Wars #001 seems like a bit of fan service. The number of callbacks to the movie littered throughout the issue seem like all there was as I think back. It is nice to see our cast of characters between A New Hope and The Empire Strikes back (a period not covered by the previous EU) as the Rebel Alliance continues to fight the empire. There were some genuine attempts at humor that fell flat for me, but the tone fit the tone of the original trilogy perfectly for me. I'm hopeful that once the writers and artists develop more of their own material that the series will shine by itself. The artwork itself was nice. I'm not an art critic so unless something jumps out at me there's nothing worth praising or criticizing here. Overall I'll give it a 2.5 out of 5. There is a lot of potential here for it to be great. For now it felt just average. Darth Vader #001 is an interesting spin on the story. It tells the story from the other side. Something that is rarely done in any universe let alone in the Star Wars universe. From the way the movies run we always just assume that Darth Vader knows who blew up the first Death Star. In the Empire Strikes back he knows who Luke is. However, there's no reason to ever assume that information was always known. Unfortunately this storyline seems like more of a tangent than the primary plot. The primary plot device is one I'm struggling with. The Emperor is pissed at Vader and is going to demote him? Really? Considering the faith put in the Force I find that extremely hard to believe he's going to leash Vader like that, but then there's the callback in my mind to Princess Leia talking about Vader's leash. The artwork here did stand out a little bit. I was a big fan of the quality of work and attention to detail in Jabba's audience chamber. Overall I'll give this a 3 out of 5. The tone is difference because the story is being told from the other side, but I'm just not certain I'm feeling the direction the primary story is headed. Again this is one issue and I feel like there is some really good potential, but I wasn't blown away. 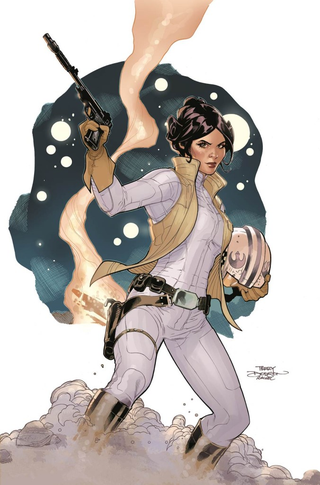 Princess Leia #01 - Unlike the other two series this one is a limited 5 book run. Unfortunately that's a major disappointment based on the first issue. It could be because the series is a limited run, but for me this one blew me away after Darth Vader and Star Wars. We often forget that Princess Leia is a Princess. Raised in a culture of royalty. This issue adds depth to some of Tarkin's comments in A New Hope and Leia's indifference and attitude that is easy to overlook when you know how the character evolves. The story itself is a must read. I'm not going to spoil it here because the sudden realization of the most obvious storyline was great for me. I'm also a huge fan of the new character that was introduced in the series. Unlike Darth Vader #1 and Star Wars #1 they didn't introduce any new characters. Princess Leia is the first to do that and she stole the story for me. Yes another female character. That's another big plus this series has going for it. The artwork here I had a bit more of an opinion on. I do take issue with one of the panels that was confusing. They magnified part of something and then later explained it. Since it was magnified I thought it was something I should immediately recognize and spent time analyzing it before reading on. Even after the explanation I wasn't a fan of that choice. Outside of that there were some other sequences that jumped out of the page that I thought were magnificently drawn. Overall this gets a 4.5 out of 5. It did seem a little off at the start, but once it picked up it was magnificent. For any Star Wars fan even if you're not into comic books I would recommend this as a must read. Edited to add: I'm a huge fan of the digital copy each issue has come with. I want a hard copy, but getting a free digital copy in addition is great. I've already made use of the digital copy a number of times to reference something. It'll be an easy excuse to re-read some issues as well since the hard copy is bagged and boarded and filed away.